Rational Marketing | Marketing that is sane; sound; intelligent; reasonable; sensible; wise. BNET recently posted a story about the success of Crumbs Bakery in New York City. The article is titled, “Startup Survival: How to Get Past the 3-Year Hump,” the point being that smart marketing makes for financial success. The rational way to raise your gross margin is to differentiate your business by redefining your company as the only player in a specific niche, instead of being just another company among larger ones. Crumbs has distinguished itself by selling the world’s best cupcake. It leads with cupcakes, reserves the best merchandising space for cupcakes and displays cupcakes above the fold on its website. If your company is the only one that can do what you do, then you can increase your margins. How can we help you solidify the idea that you are the only one who can do what you do? Perhaps this is one of the reasons we love marketing. Jennifer L. Aaker, a marketing professor at Stanford University’s School of Business, Melanie Rudd, a Stanford MBA student, and Wharton marketing professor Cassie Mogilner, examined 60 academic studies looking at the way people spend their time and how that affects happiness. Their conclusions were recently summarized in a BNET post titled, “Scientifically Proven Ways to Be Happier”. Spend time with the “right people.” Who are the right people? They’re generally not your office mates. The people that make you happiest will generally be friends, family, and romantic partners. Avoid small talk. A related predictor of happiness is how much substantive discussion a person engages in, compared to small talk. Generally, small talk makes people unhappy. If you want to increase your happiness, it’s far better to find one or two people with whom you can have a real discussion than to engage in small talk. Spend time on “socially connecting” activities, such as volunteering and spending time with friends. Work doesn’t count. Work is not ’socially connecting’ and is generally one of the more unhappy parts of the day. Commuting is also gets high marks for making people unhappy. Volunteering has been proven to be a good way to increase happiness. Memory is important, because it helps us take an event that happened in the past and extend its ‘worth’ into the future. What are your happiest memories? Day dream, or, enjoy the experience without spending the time. Research has shown that the part of the brain responsible for feeling pleasure can be activated just by thinking about something pleasurable. And we often enjoy the anticipation of something pleasurable more than the actual experience that we think is going to be so great. The most common example is vacation planning, which some find more pleasurable than the vacation itself. Expand your time. Focusing on the “here and now” slows down the perceived passage of time, allowing people to feel less rushed and hurried. Volunteering makes it seem like you have more time. In general, spending time on someone else makes people feel like they have more spare time and that their future is more expansive. Pay people to do the chores you hate. Activities that we choose to do generally make us happier than those that are obligatory. Be aware that aging changes the way people experience happiness. Youths tend to equate happiness with excitement, but as people get older, happiness is associated with feeling peaceful. Young people get more happiness from spending time with interesting new acquaintances, while older people get more enjoyment from spending time with close friends and family. Think about common paper sizes. Your printer buys paper from paper mills in standard sizes. Hopefully your printer will try to help you minimize your costs and maximize the amount of the sheet that will be used, so you are not paying for paper that you won’t use or waste. We hope that you or your designer will keep these dimensions in mind while your piece is designed. Speaking of things to think about while you design, please talk to us about postage and classification before you go to press. There may be a small alternation that you can make that will save you a large percentage in postage. The Harvard Business Review’s Daily Stat reminds us why pricing is so important. The McKinsey Quarterly found a company that was selling an industrial piece of equipment with a net margin of -200%. The lesson is that we should price products or services across the product life cycle. The example of the negative net margin occurred because an industrial-equipment manufacturer spread its costs across all products. They were deceived to believe that they were making a reasonable margin on older products. 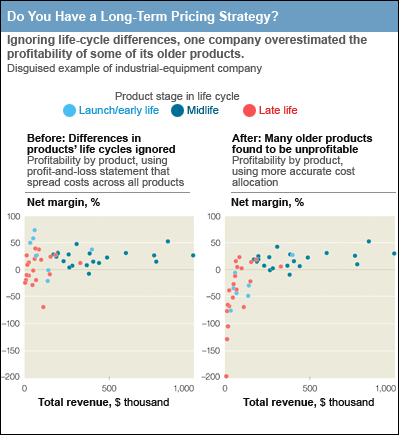 However, a closer examination of expenses of each product phase showed that older products cost substantially more to produce than it had expected. To continue with our last post about the power of color, we stumbled across a site called Information is Beautiful that posted a great chart that featured 84 feelings and emotions and the colors associated with them in the following cultures: Western/American, Japanese, Hindu, Native American, Chinese, Asian, Eastern European, Muslim, African and South American. We hope you can use some of this information as you craft your marketing and mailing messages. There are many sources and resources about color and color psychology, we stumbled across this image that was a part of post. There was some great information that we hope you can use in your marketing and mailing creative. 93% of consumers placed visual appearance and color above other factors when shopping. 85% of shoppers placed color as a primary reason for buying a particular product. Color increased brand recognition by 80%. Color can increase comprehension by 73%. Green is the easiest color for the eyes to process, it is associated with wealth, used to encourage relaxation in stores. We are here to help you use and maximize all resources and information as you put together your mailing and marketing campaigns. To continue with our ideas about building confidence, BNET summarized an interview about building self-confidence and authority during presentations. The idea is that expansive poses (arms wide apart) practiced over a two-minute period before a presentation stimulates higher levels of testosterone, the dominance hormone, and lower levels of cortisol, the hormone associated with stress. Poses, such as crossing your arms make us look smaller, weaker. A supporting idea is the act of physically occupying more space conveys many of the same benefits. Similarly, we work with our customers to help them use the largest format possible while respecting financial constraints to make the most confident statement. This really makes sense when we compare postcards of different sizes and how they look in a mailbox. We usually respond positively to confident speakers and find them more believable and credible. How can we help you translate your great speaking skills and presentation to your marketing and mailing? There is more scientific explanation about how and why getting people to act right away can be so powerful. Harvard Business Review’s Daily Stat excerpted more findings about the way our brains work. Harvard economist David I. Laibson explained that the “impatient” brain, which dominates when we think about immediate gratification, discounts at about 4% per minute, but the “patient” brain, which takes over when we consider much-later benefits, discounts at a slower rate — about 1% per minute. An offer of a free massage right now might look a lot better than a free massage in an hour, but we’d see little difference in offers of massages at, say, 2pm or 3pm one week from now. This is interesting and surprising because “in theory” we should place the same value on the messages regardless of when they are scheduled. Perhaps this helps to explain why direct mail has an immediate response spike and a very long term response. BNET shared some stories about marketing tactics that independent bookstores are using to remain successful. Expand your reach to a national market. Create a store within a store. Open your doors to the community. Cultivate the next generation of customers. One or more of these ideas could work for your business. We would love to help you implement them and put together a story to tell your customers about it. Maybe it is just the reason you have needed to mail a postcard out to your favorite customers? The Harvard Business Review’s Daily Stat summarized some findings from a Journal of Marketing article titled, the Sound of Brands. A restaurant name containing repetitive sounds puts patrons into a good mood, and they are thus more likely to order chocolate cake for dessert than fruit salad. But the effect vanishes if the name represents too great a departure from linguistic norms: 80% of participants ordered cake when they were asked to imagine they were in a restaurant called Rantifanti, compared with just 30% for Ranthfanth. The sound of brand names can affect product evaluations. For example, names such as Coca-Cola, Hubba Bubba, Tutti Frutti, Jelly Belly, Kit Kat, Bits & Bites, Lululemon, and Tostitos might elicit positive feelings, especially when the names are spoken aloud. Exposure to a brand name that has sound repetition in its phonetic structure and is spoken aloud produces positive affect, which favorably affects consumers’ brand evaluations, reactions to cross-selling, and product choice. We hope you remember this as you work on your next naming and branding project.